The coffee bean is actually a misnomer. It is in fact a seed. Normally, a pair of seeds would nestle inside a fruit, usually called cherry. The aromatic java we so enjoy is made from the coffee beans that have been roasted. Green coffee beans are the unroasted beans, and do not produce the same heady aroma or moreish taste that manage to bewitch the senses. Still, green coffee beans contain beneficial properties and Coffea arabica holds the most anti-oxidants and less caffeine than Coffea canephora (robusta) and Coffea liberica (Liberian). 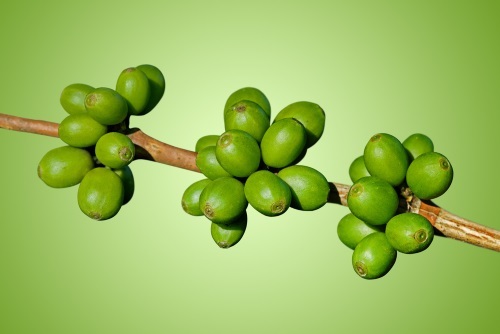 Originate from Ethiopia and currently cultivated extensively along the Bean Belt. Green coffee bean extract contains anti-oxidants and caffeine that can promote metabolisms of sugar and stored fat into energy which then help boosting the physical stamina. When combined with anti-oxidants from green tea extract it produces warming effects. Both of these effects in turn help in weight management. Green coffee bean extract has been proven to promote satiety. The anti-oxidants also neutralize free radicals, slowing down premature aging. Green coffee bean extract contains more caffeine that roasted coffee therefore individuals who have intolerance to caffeine, or medical conditions that will be aggravated by the compound must avoid using the extract or any product containing the extract. Pregnant women and breastfeeding mothers must avoid the extract. Individuals under medication must seek advice from their doctors before using product containing the extract to ensure no adverse reaction happens. Individual with bleeding disorder must avoid the green coffee bean extract as some studies have shown that it aggravate the condition. Avoid using the extract if scheduled to undergo a surgery.